Hi! This is Nagisa writing again. How have you been? By the way, do you know why 'Nagoya Obi' is called Nagoya Obi? 'Nagoya' is a place-name in Japan. According to a theory, Nagoya Obi was born there around Taisho Period(1912-1926), and spread throughout Japan. It's located in the western part of Aichi Prefecture, and we can go to there only two hours by express train from Osaka. Last month, I visited there with my friends for the first time. I'd like to talk to you about the events of the day in Nagoya. 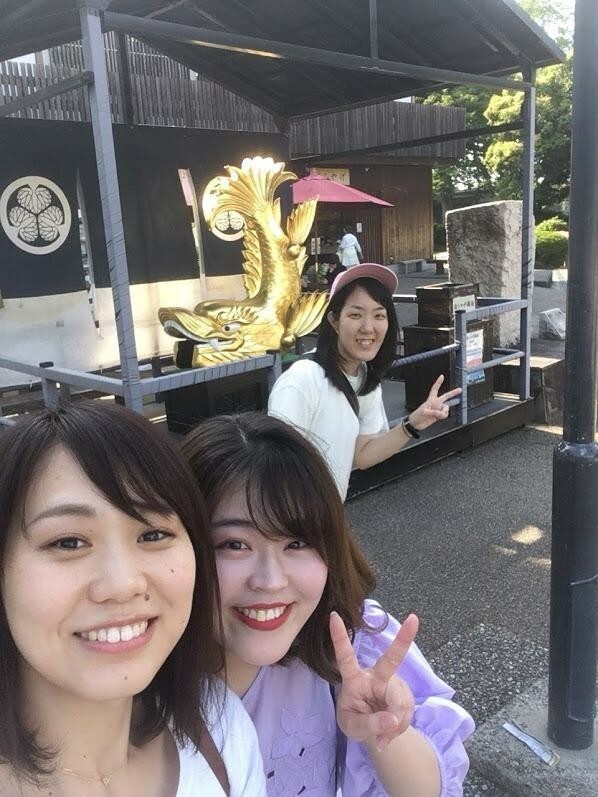 We ate Taiwan noodle, one of the famous local food in Nagoya, and we headed for Nagoya Castle in the evening. It's one of the three greatest castle in Japan, and it was built in 1610 on the order of Ieyasu Tokugawa. Unfortunately, we can't enter the castle because of the repair work, but Honmaru-Goten was opened instead. It was once designated a national treasure, but burnt down by an air raid in war. The restoration work was started in 2009, and we can see the almost all areas of its inside. There are luxurious paintings of 'Fusuma' (sliding partition) and ceiling, relieves of 'Ranma' (transom window), and decorated metal parts restored faithfully. Finally, it has been completed in this month, so you can see the all areas from now on! 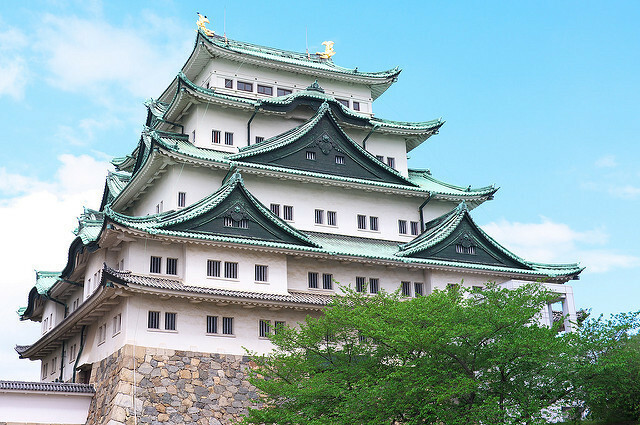 Speaking of Nagoya Castle, it has the golden Shachihoko which is the symbol of it. There were so many souvenirs with brilliant gold color sold at shops and restaurant nearby the castle. LOOK! 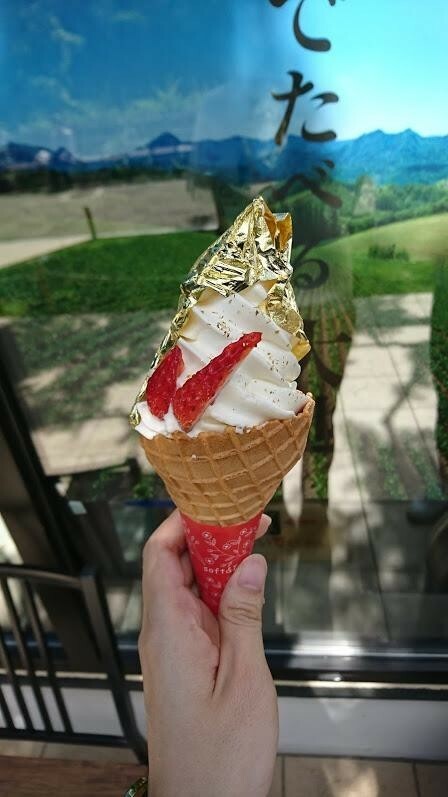 This is the soft-serve ice cream decorated with gold foils. Have you ever seen such a gorgeous soft-serve? Though its price was 980 Yen, we decided to eat it for the memory of this trip as soon as we found it. There is one more thing that we were fascinated with. Here it is ! This is the stature of Kiyomasa Kato. He is a general who was known as skillful castle builder. He build the stone wall of the castle, too. This statue is reproduced the scene that Kiyomasa encouraged his subordinates on a large stone. The large stone named 'Kiyomasa Ishi' was also displayed among the stone wall, but it says that it was brought by Nagamasa Kuroda, not Kiyomasa. And, the lord of the castle was Yoshinao Tokugawa who was Ieyasu's ninth son, not Kiyomasa! Yayakoshiiiii! However, we don't know who is he at that time. We just love his pose! 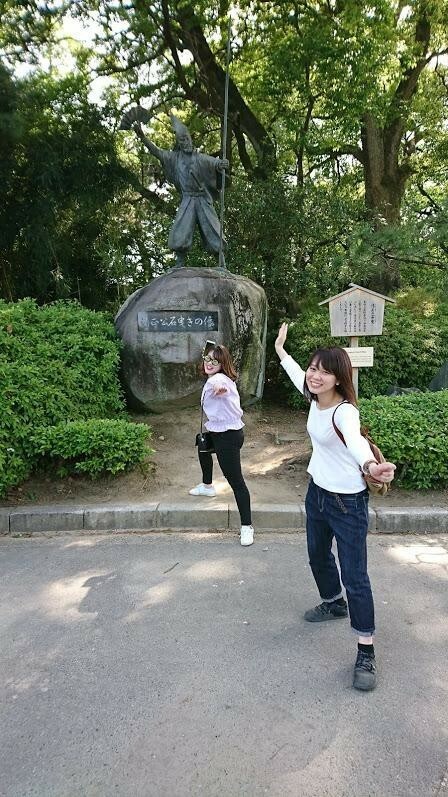 We enjoyed taking pictures here and there with Kiyomasa pose. 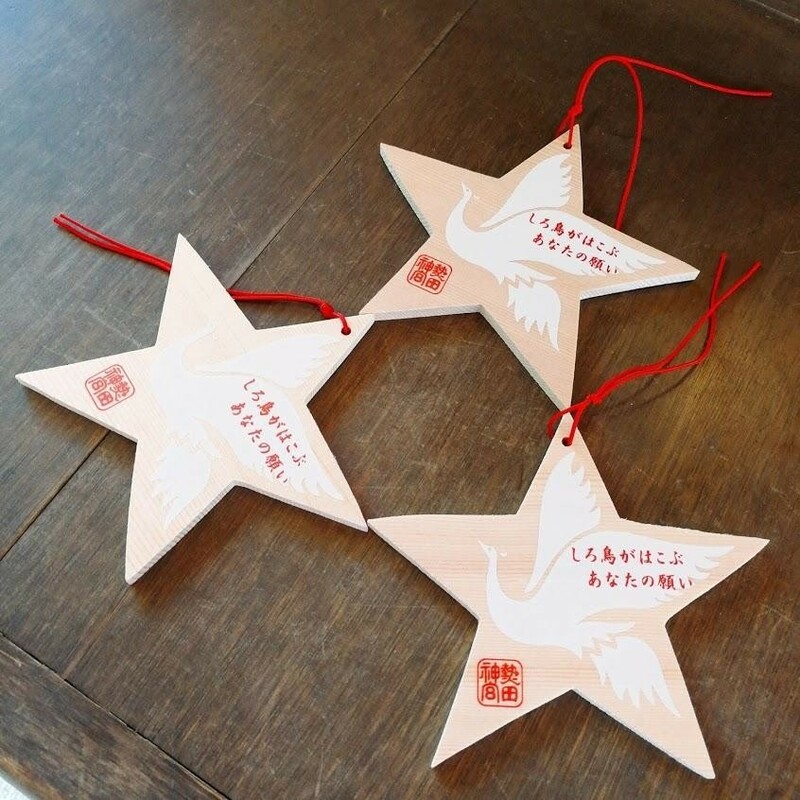 !There are some items of castle design with Japanese scenery! Lastly, we went to see Teru san at night. It was the main purpose of this trip. He is our senior in college, and I was supposed to meet him for the first time in five or six years. However, we gathered unexpectedly at the funeral of Teruko Sensei, so it has been two weeks sine we had last met actually. He showed us the slide which was projected during the funeral, and told us some episodes with Teruko Sensei. 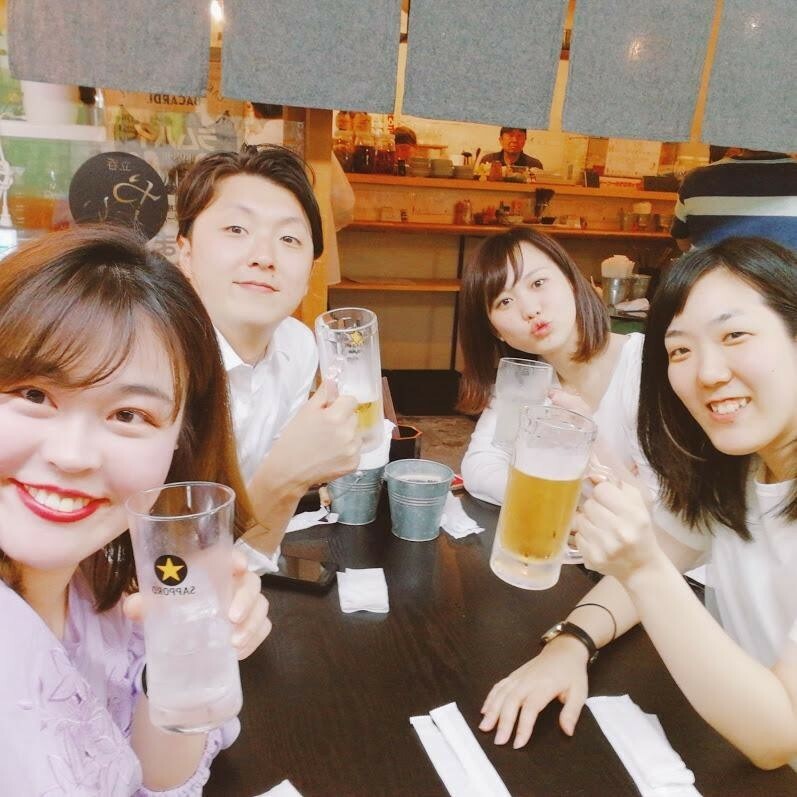 We talked together about memories with her while laughing, crying, drinking and drinking. He may be tell me some heart-warming stories as he used to be. However, I don't really remember what he talked about with deep grief. I believe that it never caused by alcohol. Never...! After that, I almost checked in at a mistaken hotel, though. Thank you for reading till the end. I'm doing fine thanks to big love from people around me. See you next time!